CORVALLIS-M. Rebecca “Becky” Coffman, 48, of Corvallis, died at Corvallis Care Center. She was born and grew up in Corvallis, the daughter of Steve and Mary (Martin) Wilson. 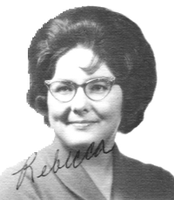 She graduated from Corvallis High School in 1965 and attended Oregon College of Education (Western Oregon State College) in Monmouth. She married Curt Coffman on Oct. 1, 1983, in Corvallis. Mrs. Coffman had worked 12 years as an Oregon Vocational Rehabilitation Division counselor. She belonged to the Council of Governments and helped organize the Jingle Bell Arthritis Fund.She enjoyed working with disabled and elderly persons. Mrs. Coffman belonged to the Grant Avenue Baptist Church of Corvallis. She was also a member of the Enduring A’s Chapter of the Model A Club of America and the Corvallis Historic Automobile Club. Her hobbies included cooking, entertaining family and friends and handicrafts. Surviving are husband Curt of Corvallis, stepdaughter Sarah Coffman of Beaverton; brother Robert Steve Wilson of Citrus Heights, Calif.; sisters Henrietta Duce of Corvallis and Geraldine Brown of Kirkland, Wash. Her parents died before her. Mrs. Coffman’s funeral will be at 11:a.m. Saturday at the Grand Avenue Baptist Church of Corvallis with Pastor Don Reeves officiating. Burial will follow at Alsea Cemetery. Memorial contributions many be made to Grant Avenue Baptist Church for the youth ministry, in care of DeMoss-Durdan Garden Chapel, 815 N. W. Buchanan Ave., Corvallis, 97330. I last saw Becky and her husband at Winco just before the 1995 reunion. She passed away on October 31, 1995 from complications of Lupus, according to her sister Henrietta. Becky served for many years as a counselor for the State of Oregon Vocational Rehabilitation Division. She also made gorgeously decorated wedding cakes. Becky was an advocate for people with physical disabilities, working with local businesses through the Architectural Barriers Counsel to make buildings more accessible to customers using wheelchairs. Despite crippling arthritis, she always kept a bright and cheerful disposition. Resubmitted by Rose Westwood Merrick in August, 2010 following the 45th Class Reunion. Becky was a truly inspirational woman. Her sunny smile, funny stories, and enduring faith lit up her surroundings wherever she went. She had a severe form of Lupus Erythematosis, an autoimmune disorder, which caused chronic infections and multiple hospital stays. She also had a crippling form of arthritis so she used a wheelchair to get around. When her condition was stable, she found time and energy to serve on the Architectural Barriers Council in Corvallis, checking out restaurants and retail stores for accessibility issues. She also enjoyed baking and decorating cakes for friends and family for special occasions. I last saw her while shopping at Winco just prior to the 1995 CHS Reunion. She passed away three months later, in October. Submitted by Rose Westwood Merrick in August, 2015 just before the 50th reunion. Click here to see Rebecca's last Profile entry.